Valid on holiday departures from 1st November 2017 until 31st March 2019. £60 saving per booking to be redeemed by entering the unique promotion code printed on your "Rain Cheque" at time of booking. Minimum of 2 adults per booking. Single Travellers can also claim £30 saving per booking by calling Cannon Travel offices in Hoddesdon (01992) 441521 or Ware (01920 466531). Available on Sun & Winter Jet2holidays, not available on Jet2CityBreaks. The promotion code must be given at time of booking to receive discount. £60 Saving applicable to final balance only and cannot be used against the deposit. 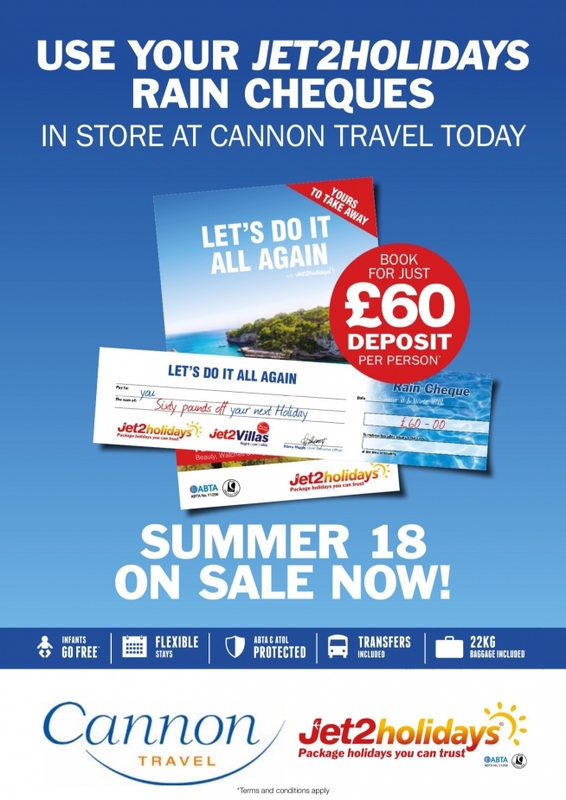 Saving applicable to new bookings only through Cannon Travel.